For many years, local resident John Thomas has been encouraging the local badgers to look for treats in his garden next to Lion Coppice. The gallery below shows just a few of the many photographs he took of wild badgers looking for the carefully hidden tidbits. When the new A49 link road was built it was Mr Thomas who wrote to the Highways Authority and successfully persuaded them to construct a special underpass beneath the road so that the badgers could continue to forage in and around Lion Coppice. The badgers are once again under threat, this time from Persimmon Homes with their plan to build 250 houses on the field to the east of Lion Coppice, a development that would effectively block the badger's access to the woods. The ecology report commissioned by Persimmon concluded that "Given the lack of any evidence for the presence of this species, it is considered unlikely that badger is present." These photographs prove otherwise. A big thank you to John Thomas for permission to reproduce his photographs on this website. 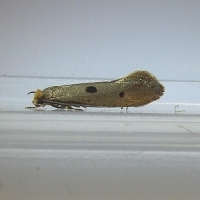 Tinea trinotella a micro moth that is quite common in birds' nests, where it feeds on detritus and food remains. This one was caught flying at dusk on 10 June 2013 and is the 179th moth species to be added to the species list.